The Scene of the Mass Crime takes up the unwritten history of the peculiar yet highly visible form of war crimes trials. These trials are the first and continuing site of the interface of law, history and film. 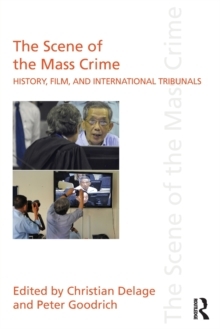 From Nuremberg to the contemporary trials in Cambodia, film, in particular, has been crucial both as evidence of atrocity and as the means of publicizing the proceedings. But what does film bring to justice? Can law successfully address war crimes, atrocities, genocide? What do the trials actually show? What form of justice is done, and how does it relate to ordinary courts and proceedings? What lessons can be drawn from this history for the very topical political issue of filming civil and criminal trials? This book takes up the diversity and complexity of these idiosyncratic and, in strict terms, generally extra-legal medial situations. Drawing on a fascinating diversity of public trials and filmic responses, from the Trial of the Gang of Four to the Gacaca local courts of Rwanda to the filmic symbolism of 9-11, from Soviet era show trials to Nazi People's Courts leading international scholars address the theatrical, political, filmic and symbolic importance of show trials in making history, legitimating regimes and, most surprising of all, in attempting to heal trauma through law and through film. These essays will be of considerable interest to those working on international criminal law, transitional justice, genocide studies, and the relationship between law and film.